The rideshare industry has expanded at a fast pace since its debut in 2012. Last year, Uber executives estimated their drivers were providing 2 million rides a day worldwide. In the U.S., the growth has been so rapid that, when it comes to insurance, the nation’s regulators, insurers and drivers are all struggling to catch up. A new survey found that many rideshare drivers may not have enough auto insurance coverage to fully protect themselves, and that they also don’t understand the risks involved. This raises implications not only for drivers, but also for the riders who use services like Uber and Lyft every day. Rideshare insurance is complex and constantly evolving. Companies that provide rideshare services offer insurance protection for drivers during specific periods, but that protection drops considerably at other times. Generally, when drivers are waiting for a call, they are only fully protected if they are covered under certain personal rideshare insurance policies, and that coverage isn’t available in every state or from every insurer. Relying on one’s personal insurance policy may not be enough. Some carriers’ personal policies don’t cover vehicles being used to transport passengers for a fee, and some may even cancel a driver’s coverage if he is involved in an accident while driving for a rideshare — particularly if the driver has not informed the insurance company that the car is being used for rideshare driving. Passengers are mostly covered in case of an accident, but there may be gaps there, too. Both Uber and Lyft offer $1 million in coverage when passengers are in a rideshare car. In serious accidents, where injuries and damage can exceed $1 million, it gets more complicated. Riders can make a claim against the rideshare driver’s personal auto insurance, if available, or file a personal injury lawsuit against the rideshare company, but only in some states and under certain circumstances. In an effort to examine how many rideshare drivers are paying for additional coverage, NerdWallet worked with SherpaShare, which provides an app that helps 50,000 rideshare drivers track mileage, earnings and expenses. The insurance coverage survey of 1,022 SherpaShare users across the U.S., conducted Jan. 26-Feb. 9, 2016, via the app and company blog, found that the majority of respondents may be underinsured, at least some of the time. Many drivers don’t have extra coverage. 77% of respondents said they didn’t have additional rideshare insurance coverage on top of what their company provided, which puts them at risk while they are working, but waiting for a call. Cost is a concern. Of the drivers who don’t have extra coverage, 32% cited cost as the reason. Drivers may underestimate their risks. Of those who went without additional coverage, 31% said they’re comfortable with what their rideshare company provides, but 4% stated that they lacked an understanding about the issue. Laws make a difference. The drivers with additional coverage, 43% of respondents, said they got it to comply with local laws. Rideshare drivers are looking to add coverage. In the survey, 40% of drivers without additional coverage said they plan to purchase it in the next three months. Rideshare insurance varies depending on whether there’s a passenger in the car or if the driver is waiting for or going to a call. Uber and Lyft provide insurance coverage when passengers are in the car, which is known as Period 3 coverage. When the driver is en route to a call, drivers are covered by Period 2 insurance. But both companies provide only limited coverage, called Period 1, when drivers are logged into their apps and waiting for a fare. With 77% of drivers in the SherpaShare survey saying that they haven’t purchased additional coverage, there is a large group of drivers who are at risk should they be involved in an accident while waiting for a call. Uber and Lyft provide at least $1 million per accident in liability, uninsured and underinsured motorist coverage during periods 2 and 3. They also offer limited collision and comprehensive coverage, but only to drivers who already have this personal coverage on their vehicles. But when drivers are waiting for a fare, in Period 1, their primary coverage is provided by the personal or commercial coverage they’ve purchased. Rideshare company policies only kick in to cover liability or damage not covered by the driver’s own insurance. The liability limits in Period 1 are $50,000 per person for injuries, capped at $100,000 per accident total, and $25,000 in property damage for each accident. And there is no coverage provided for damage to the rideshare vehicle. Of the SherpaShare survey respondents who didn’t have additional rideshare insurance policies, 31% said they were comfortable with the coverage provided by the rideshare companies. It could be that these drivers don’t mind taking on the risk, or they may not understand those risks. Although it wasn’t a selection in the multiple choice survey, 4% of those who don’t have additional coverage left comments indicating they didn’t understand their options and/or the issue. Twenty-three percent of surveyed drivers had purchased additional insurance coverage. Of the women who responded, 27% opted for an additional policy, while 21% of men did. Rideshare-friendly policy. Of the drivers with additional coverage, 36% have rideshare-friendly policies that don’t provide additional coverage, but mean the insurer won’t cancel coverage on a rideshare driver. Period 1 policy. Those with additional insurance, 31%, have a Period 1 policy. The policies, which cover drivers when they aren’t on a call, but are waiting for one, specifically fill the gap left by rideshare company coverage. Commercial rideshare policy. In the SherpaShare survey, 24% of drivers who have extra coverage have commercial rideshare policies. These policies, which are the most comprehensive available, provide coverage at all times. For periods 2 and 3, this policy provides extra coverage should an accident exceed the rideshare company’s policy limits. The survey found that 32% of surveyed drivers said cost was a factor in going without additional coverage. Not all insurance carriers offer rideshare policies, and those that do may offer them only in certain states. But such policies are increasingly common and affordable. 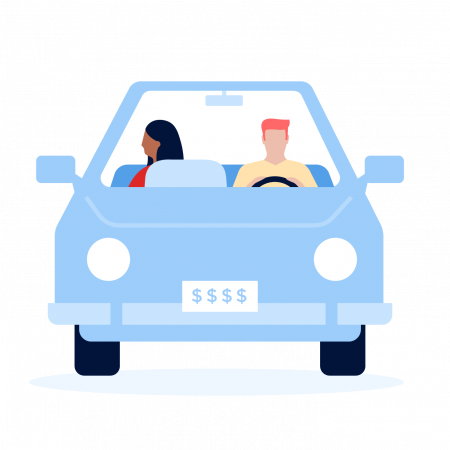 Costs vary by driver, policy, carrier and location, but a rideshare driver could pay an additional $20 a month or less for Period 1 coverage on top of an existing personal policy. Commercial policies are more expensive, but some carriers are offering more affordable commercial coverage for rideshare drivers. The ridesharing industry is relatively new, and insurers and lawmakers are just catching up with products to cover the risk. By the end of 2015, 29 states and Washington, D.C., had enacted laws to close insurance coverage gaps, according to Property Casualty Insurers Association of America. These laws require action by ridesharing companies, which have had to increase coverage amounts in some areas; and by insurance carriers, which have had to expand or adjust policy offerings. The new laws also require that drivers take out additional insurance or understand the risks involved when declining coverage. In the survey, 43% of drivers with additional rideshare insurance purchased that coverage to comply with such laws. California’s 2014 rideshare law, for example, requires drivers to have liability insurance during all three periods, and rideshare companies to provide $1 million in liability coverage during periods 2 and 3. Other states including Colorado, Georgia, Maryland and Washington as well as Washington, D.C., have similar laws designed to close rideshare coverage gaps. Minnesota requires rideshare companies to provide $1.5 million in coverage during periods 2 and 3. Some cities have additional requirements. For example, New York City requires rideshare drivers to have commercial coverage. These laws have prompted Uber and Lyft to supply more generous coverage — sometimes location-specific — and have pushed insurance carriers to create new offerings and policies. Many states are still working on legislation, and it’s possible these laws and new opportunities to buy policies could push more rideshare drivers to seek out extra coverage. Meanwhile, drivers as well as passengers should understand their rights and risks when using ridesharing services. Uber’s terms of service denies any liability if a passenger is injured and requires binding arbitration if there’s a dispute. The company also recently changed its contract with drivers to require arbitration of disputes. So it’s important to keep in mind that the ridesharing economy is a risk-sharing one as well. Elizabeth Renter is a staff writer at NerdWallet, a personal finance website. Email: elizabeth@nerdwallet.com. Twitter:@ElizabethRenter. Diamond Richardson is a data analyst at NerdWallet. Email: drichardson@nerdwallet.com.